Happy Easter from all of us here at Clarkdale Volkswagen! 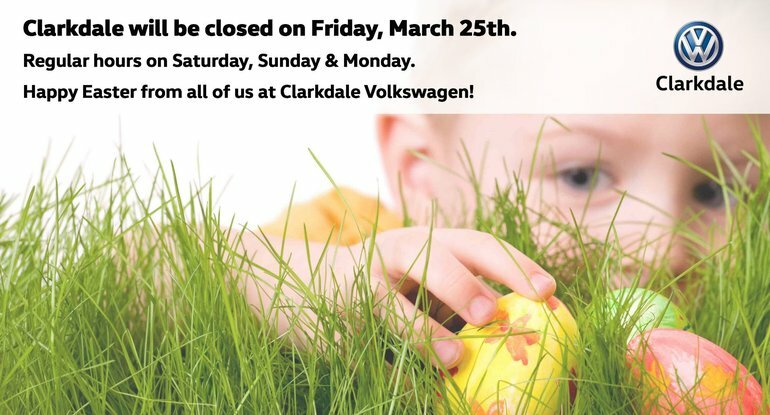 Please note that our VW Dealership will be closed on Friday, March 25 but we’ll be open on Saturday, Sunday and Monday! Stanley Park Easter Train: Take the Stanley Park Train for an Easter ride through beautiful Stanley Park. After the train ride, kids can go for egg hunt, meet the Easter Bunny, get their face painted and much more! Ticket information is available on the Stanley Park Easter Train website. VanDusen Great A-Mazing Egg Hunt: We love VanDusen Botanical Garden, especially during cherry blossom season! On March 26th, experience the most unique egg hunt event in Vancouver with 6 different outdoor hunt areas, the Easter Bunny, chocolate treats and much more. And egg hunt tickets include FREE entry to the entire botanical garden! More info on VanDusen website. Vancouver International AutoShow: Exciting new models, exotics and supercars. Have a look at all the cool new models Volkswagen has in store for you! You can even drop the kids off at the Volkswagen Playcare Centre so you can all enjoy an awesome day at the AutoShow. More info at the Vancouver International AutoShow website. PS: Who needs a bunny when you’ve got the Beetle? Here’s the fastest way to colour Easter eggs.